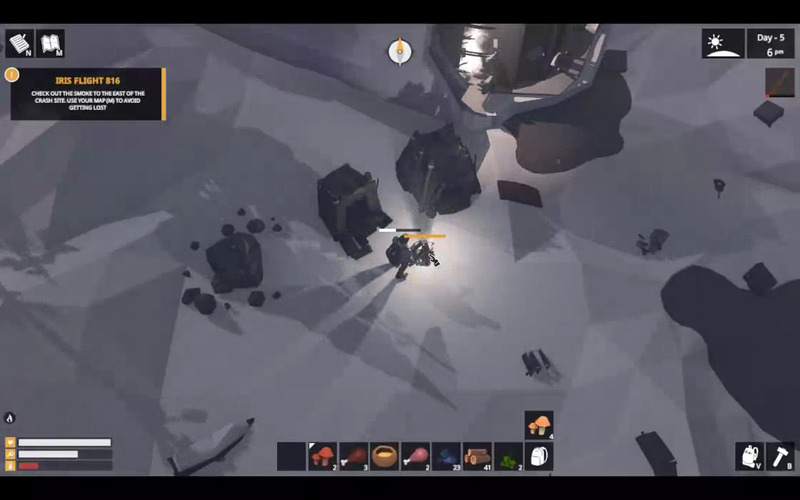 Survival games are commonplace in today’s video game market. There’s just something stirring about mankind’s will to survive against all odds, against all elements, and against all creatures. That being said, a lot of survival games, in my humble opinion, fall into one singular category: they’re all about surviving in a temperate or tropical location. What about the frozen tundras and icy wastelands? Well, The Wild Eight, developed by Fntastic/Eight Points and published by HypeTrain Digital seeks to change that little fact. So when they gave us a copy of the game to check out, I was happy to take on this little challenge. So, does surviving the frozen North compare to taming lush jungles or pristine forests? Caught in a plane crash in the harsh Alaskan wilderness, (up to) eight survivors must brave the harsh cold in order to return to civilization. 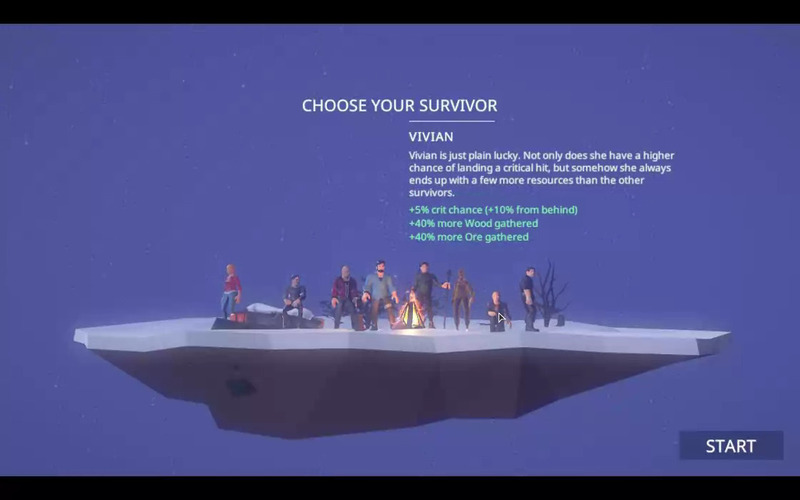 Each of the survivors have their own unique traits that make them suited for one task or another. I rather liked this element; there are already far too many survival games where everyone is equal. This coincides quite nicely with another different feature of The Wild Eight: the game is cooperative, rather than competitive. On a small scale, it makes no sense for survivors to be competing over resources instead of working together, and The Wild Eight really seems to reinforce this point. For the solo player, of course, this means choosing the character that best suits your playstyle. In multiplayer situations, however, you can decide to play the doctor of the bunch to create better healing salves, or be the hunting specialist, and track, trap, and otherwise dress your kills for the rest of the group. It’s specialization done right. So, obviously, you’re going to need to find shelter, and fast. Conveniently, the game places a tent right next to your crashed ship. That’s one small gripe I have. You’re already going to be gathering wood and stone for other projects, but you’re given a tent instead of being made to build a lean-to or bivouac? Let’s not forget there’s also the issue at the start of needing to punch trees and boulders to gain the aforementioned wood and stone, too. While I suppose there needs to be a little suspension of disbelief involved, it still makes little sense. With the wood and stone you gather, you eventually build a workshop, and then you can start producing tools. You’re also not able to create everything right away, which is a nice touch. 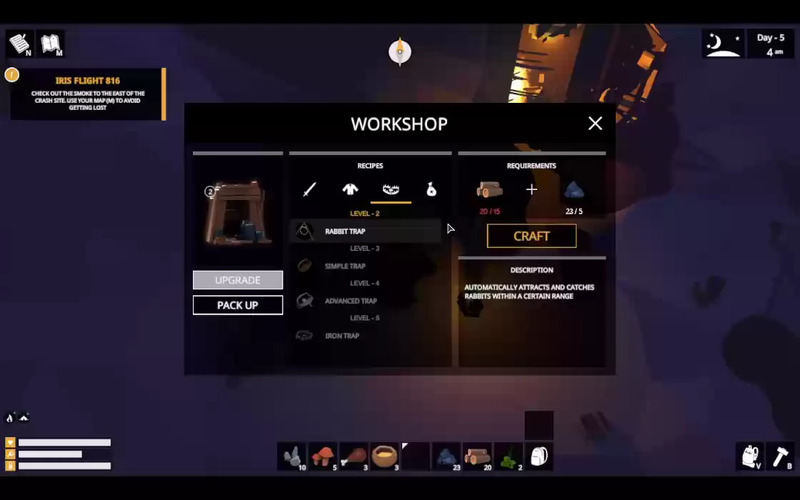 You need to upgrade your workshop in order to make the better items available, which, believe me, you’ll want to do as soon as possible if only to be able to make some shoes and clothes. Out of wood. Because it’s better than nothing but the clothes on your back, right? So, I mentioned the workshop can be upgraded, but so can that tent you found. 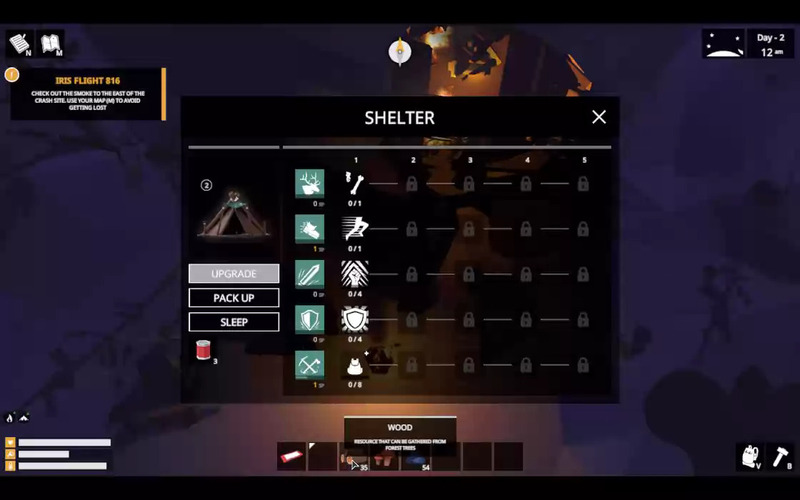 Upgrading the tent adds some storage space — it’s a survival game so people and inventory space are premium too — as well as offering some additional perks such as warmth. Using the tent is also how you’ll develop your character with the skill points you’ll earn. How do you earn skill points? Why, by doing things the skill demands! 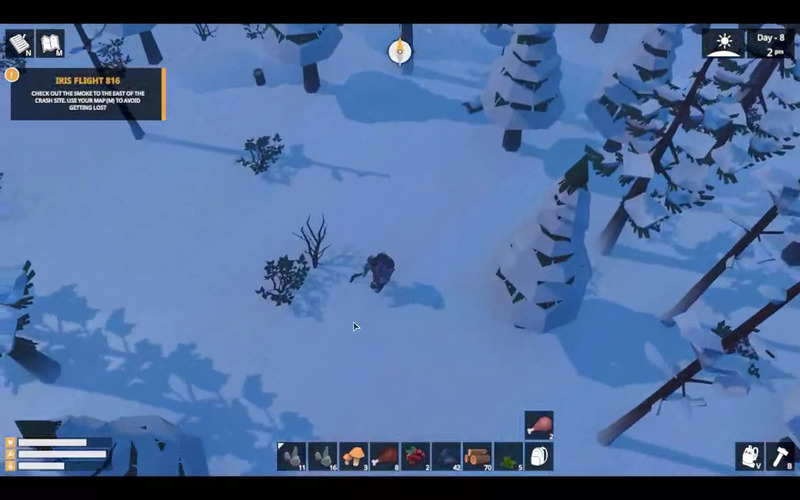 Gathering levels up by gathering wood and stone and hunting by successfully killing animals, for instance. Each level in a skill provides a skill point, and these skill points can be used to gain additional skills in each of the disciplines. So, at the core of gameplay, you gather materials (meat, bone, tendons, and leather are also materials, okay?) to craft and upgrade your items to make you more and more survivable. Why, though? Well, there are, interspersed throughout the wilds, a wide variety of quests and subquests. Completing these provides you with various rewards, and offers some insight into some colorful happenings in the area. Oh, and you also do this to defend yourself against wolves and bears. Wolves and bears hate you. Sorry. 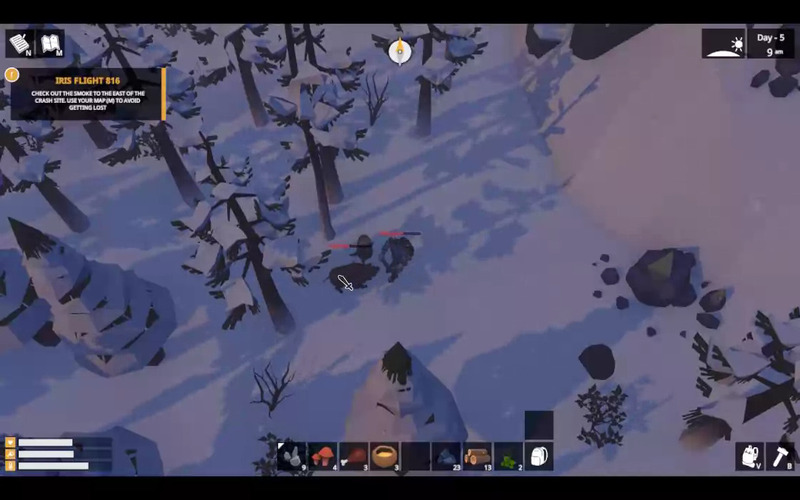 The Wild Eight, while still considered Early Access, is still quite a full game. I tend to have patience problems and, thinking I can handle anything thrown at me, rush out into the wilds only to meet an untimely end. This is what The Wild Eight does well: it forces you to prepare. At its initial release there was only one difficulty level. Dying means you’re back to where you started with nothing more than the initial tent you put up. Sure, you can try and fetch your items, but that wolf or the bear that horribly mauled your face is also still there, waiting. You, essentially, start anew, to try and better prepare for next time. The game has, however, released an easy difficulty mode for players that want to enjoy the stories the game provides in its quests. You keep almost everything upon death, except for the items you had on you. Updates to the game have been very frequent, too, which is always a great sign of a healthy early access title. Will you like The Wild Eight? It’s hard to say. If you’re a fan of survival games, it might be right up your alley, especially if you’re looking for a much more cooperative experience with friends. That being said, it’s hard to say if there will be anything for everyone else, at least right now. This allows people to enjoy elements from Final Fantasy XIV's "Eternal Bonding Ceremony" from in-game in real-life. Jagex confirmed it has been acquired by Chinese investors with immediate effect and a new Board of Directors has been constituted. Today, Bethesda Softworks announced that a Gold Edition of The Elder Scrolls Online will be available September 9.